Pursuing regular movement, a nutritious diet, adequate sleep and practicing safe behaviors. How can I become physically well on campus? Incorporate regular physical movement into your daily routine (i.e. walk or ride your bike to class; take the longer route). Focus primarily on how exercise makes you feel, especially the stress-relieving and energizing factors. Visit the WRC for intramurals, fitness classes, outdoor recreation trips, the pool, rock wall, or to utilize the fitness area. Make food choices that honor your health & taste buds while making you feel well—variety, moderation and balance is key! Check out studentwellness.uni.edu/eating-wellfor healthy eating strategies. Take charge of your sexual health by using protection; having open communication with your partner(s); getting tested for STDs and getting routine physical exams. Call 319-273-2009 to make an appointment at the Student Health Clinic. To discuss healthy sleep habits with a professional staff member from Student Wellness Services, call 319-273-3423. Seeking to expand knowledge, skills and creative abilities. How can I become intellectually well on campus? Visit the The Learning Center in the ITTC for tutoring and learning services, subject specific study skills, & assistance with educational planning. Take advantage of the research help at the Rod Library. Ask questions about topics such as: finding journal articles, using databases, or making the best use of other Rod Library services & resources. Talk to your Peer Academic Advisors in Residence (PAIR) – Peers in your residence hall who can help you find information, make connections, & navigate the university. Talk to your Academic Advisor. Your Academic Advisor's name is listed on your STUDENT CENTER within MyUNIverse. Engaging in work that is meaningful, enjoyable and aligns with personal values. How can I become occupationally well on campus? Visit the Office of Career Services in 102 Gilchrist Hall for help with resumes, references, cover letters, mock interviews, and more! Use career assessment & tools to explore careers: careerservices.uni.edu/career-majors. Gain the skills to be "career ready" for any job by volunteering in the Cedar Valley or joining a student organization. For job and internship opportunities, visit the UNI Job Board. Visit the Job and Internship Fair+ in both the fall and spring semesters. Expanding our sense of purpose and meaning in life based on a core set of values and beliefs. How can I become spiritually well on campus? One option is joining a faith-based community at UNI. There are a variety of styles, sizes and philosophies of campus ministries; some have their own facilities, while some meet on campus. Each has a registered student organization. The Campus Ministries Association is another resource that seeks to share resources of faith, hope and love to all who belong to the university community and beyond. Walk the labyrinth, a path that one walks to reflect, meditate, reduce stress, or find inner peace. If you are interested in walking the labyrinth, contact Joan Thompson with Student Wellness Services at (319) 273-2137. Choosing a lifestyle of committed effort toward sustaining the Earth’s natural environment. How can I become environmentally well on campus? Join an environmental student organization. Get involved with the Panther Plot, UNI’s student-run garden! Donate any unwanted usable items at Panther Pick-Up during finals week. Trucks from St. Vincent de Paul & The Salvation Army will be by the residence halls. They will be accepting houseware items, shoes, clothing, futons, etc. Explore the outdoors by going on an outdoor adventure trip! Making responsible decisions to live within your means and setting financial goals today that will positively impact your financial future. How can I become financially well on campus? Register for “Live Like a Student” a FREE, non-credit course that will allow you to explore the concepts of budgeting, credit, student loans, and identity protection. Obtain One-on-One Money Management Counseling: Obtain personalized budgeting assistance, information about your award notification and bill, and much more. Check out the Office of Financial Aid’s money management resources. Establishing a sense of connection and belonging through positive interpersonal relationships. How can I become socially well on campus? Get involved! Consider joining a student organization or sport club. You’ll make new friends, learn new skills, and feel more connected to UNI! Stay on campus as much as possible! Take advantage of the endless opportunities you have as a student, and enjoy the social events on campus. For more information, go to: uni.edu/resources/campuslife. Possessing a positive attitude and the ability to identify and express a wide variety of feelings in an appropriate manner. How can I become emotionally well on campus? Take time for you! Be sure to set aside some time to partake in activities that help you relax and relieve stress. Whether it’s exercising at the WRC,going on an outdoor adventure trip, meditating, or writing in a journal, treat yourself! 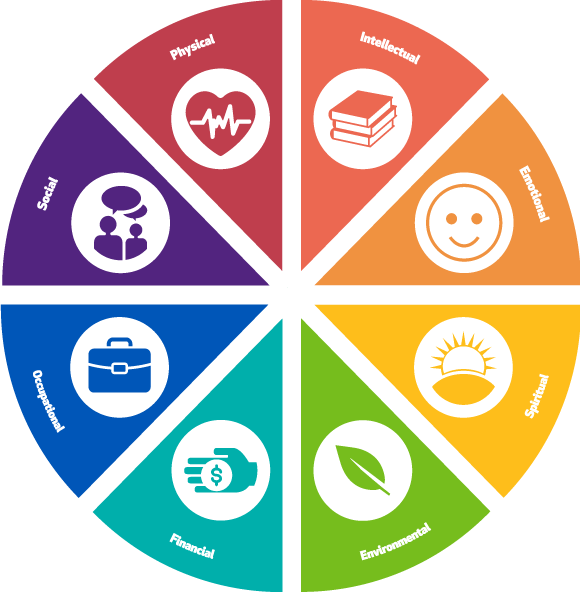 Go to ulifeline.org/uni and check out the Self-Evaluator, a free mental health screening tool. Don’t be afraid to seek help! Call the Counseling Center at (319) 273-2676 for free and confidential counseling services. You can also call the UNI Counseling Center 24/7 to speak to a crisis counselor. Dial 319-273-2676 and press 2 to speak to a crisis counselor. 24/7 CRISIS TEXT LINE: Text HOME to 741741 about any type of crisis. A live, trained Crisis Counselor receives the text and responds quickly. The Crisis Counselor will introduce themselves, reflect on what you've said, and invite you to share at your own pace. The conversation typically ends when you and the Crisis Counselor both feel comfortable deciding the you're in a "cool" safe place. To discuss stress management techniques with a professional staff member from Student Wellness Services, call 319-273-3423.